The announced reorganization of the Campagnolo factory in Italy affecting 68 jobs, including the relocation of a part of the production to Romania, has caused a lot of turmoil in Italy. Around 2005 the company, founded in Vicenza in 1933 by Tullio Campagnolo, opened its first Romanian plant. The second facility followed four years ago. Part of the production was relocated to low labour cost Romania. Until now the relocation hadn't affected the Campagnolo plant and headquarter in Italy. The news on the reorganization spread through the social media first, it was picked-up by the Italian media and finally confirmed by a brief note from Campagnolo early this week: 68 out of 399 workers of the Vicenza plant will be laid-off, mainly in the manufacturing areas. Trade unions also issued a press release stating that, "In a meeting which was held Wednesday, January 21, 2015, Campagnolo management announced to employees' representatives and trade unions (FIM CISL and the regional FIOM CGIL) their intention to proceed with a substantial reorganization. This will affect the company's main facility in Vicenza." 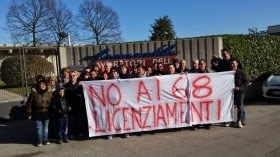 The management decision to lay-off 68 people caused a real turmoil and two days ago, Campagnolo workers marched on to strike, starting from the company's plants towards the Vicenza trade fair. According to Campagnolo's statement, the reorganization is inevitable to ensure production continuity on the Vicenza site, which also houses the Group's R&D and all activities related to the development of new products and the implementation of new technologies. "The plan aims to recover market shares and margins that have eroded in recent years, due to the declined competitiveness of our Italian facilities. For the future the company wants to focus on innovation and product development. Thanks to future investments Campagnolo firmly declares the continuation of some production departments like for high-end components, in Vicenza." The trade union objected to the plan, not only for the loss of jobs and partial demolition of the historical site of Campagnolo, but also because, "It does not include any real intention to invest to make the Vicenza plants more efficient and increase its competitiveness, in order to face the new challenges of the global market," as the press release of the Italian trade union stated. When asked, Campagnolo Press Manager Joshua Riddle confirmed the news on the reorganization and stated that the company did not want to comment further. Very sad, especially as Campagnolo is an official supplier to CycleItalia. Made-in-Romania is not a good solution. Would anyone buy a Ferrari made there? What would Tullio do?